In making this game I wanted to take something from the physical world in the digital as an example I can use in class. I also wanted to explore how the game would change in that process. A spin-off effect is that now anybody can play this game and they don’t need me there. The way to play it is to use what’s presented on the screen in a short ~1 minute game pitch. In class we keep it quick and it works as a fun, quick, useful activity. 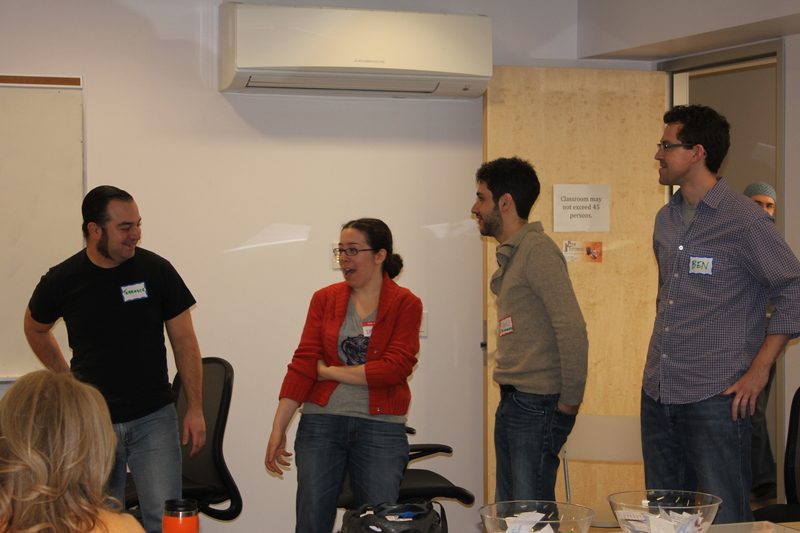 Game Design Improv (GDI) started at Board Game Jam a few years ago and was a hit amongst participants and spectators. The participants were at the front of the room and had to think up a game pitch based on the cards they pulled from a hat. It started simply with a few decks of cards divided into: theme, object, game mechanic, and something random. The goal of the game is just to produce the most game ideas in a short period of time. For Board Game Jam there was also the goal of making people laugh, thus the word improv in the title. (Terrance stole the show). The game proved to be fun right from the start. Then I ran into a problem…. The original card deck has been lost forcing me to start again from scratch. So I figured it made sense to go digital. This time around I first tried providing the categories of theme, narrative, game mechanic, genre, and something random. Each category was initially populated with 40 items each. It was quickly revealed that narrative and theme were too close to one another in subject and that having both limits creative freedom (thanks to Denis & Aaron). I ended up merging narrative and theme into one: story. This looks like a challenging game. That meant room for one more category so I chose to go back to the original version and re-add object. Earlier players of the card version found that the object category contained non-objects and so I figure calling the category ‘thing’ is a fine solution. There is the one problem that the game doesn’t feel like much of a game without the live interactive portion. 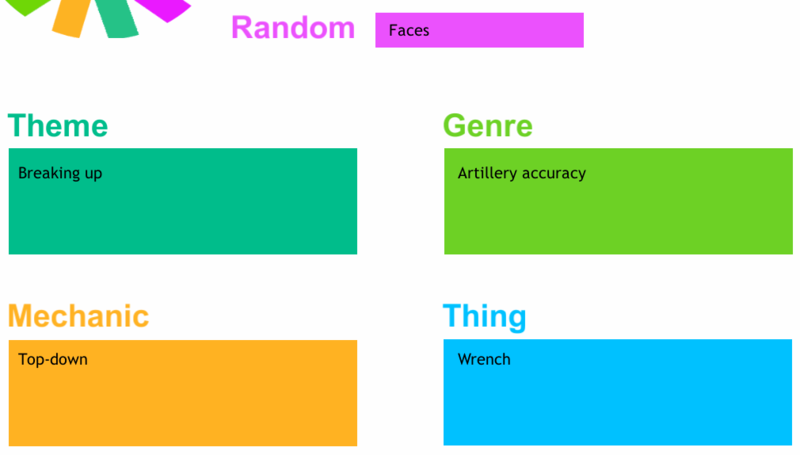 As a result, I’m thinking of evolving this into something more than just a fun idea generation tool into an app for storing one’s ideas for games as a whole. 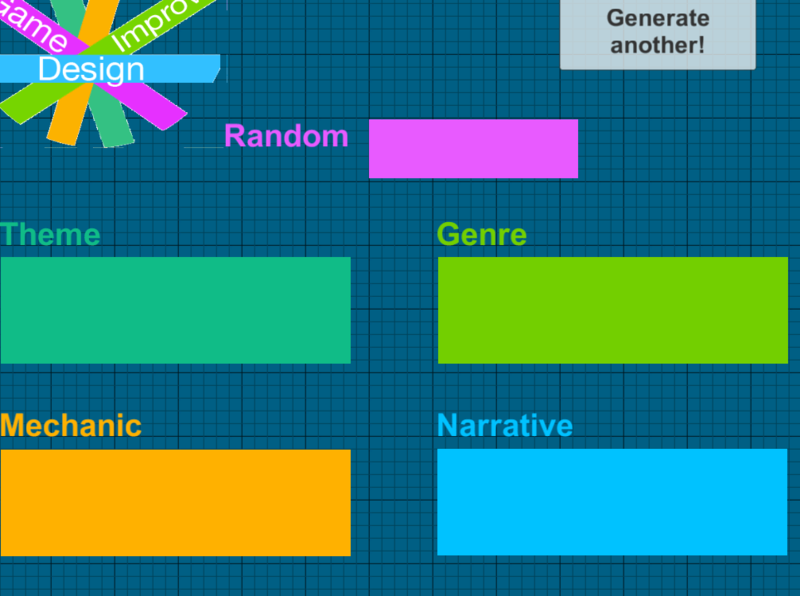 I’m sure that there’s going to be criticism around my use of genre and story as categories and what they contain. Let me be clear: genre is really for marketing so in the GCI context take it as you will; story is purposefully vague to encourage more creativity. On the technical side, I used the open beta of Unity 4.6 with enhanced UI capabilities. I ran into a bug which kept destroying the main menu scene which was rather frustrating (that’s why it’s in beta). Still, I’m impressed with the easier UI creation in Unity 4.6. It’s also the first game coded in C# entirely on my own until I ran into that menu bug. Marty (from 13am) helped me identify the issue: don’t create a class named Main. I’m just testing the build right now on my iPad and will be submitting it to the App Store later this week.